First Number of Interest: $680,000. Second Number of Interest: $1.6 million. That’s how much NBA teams are expecting to come off the cap next year. 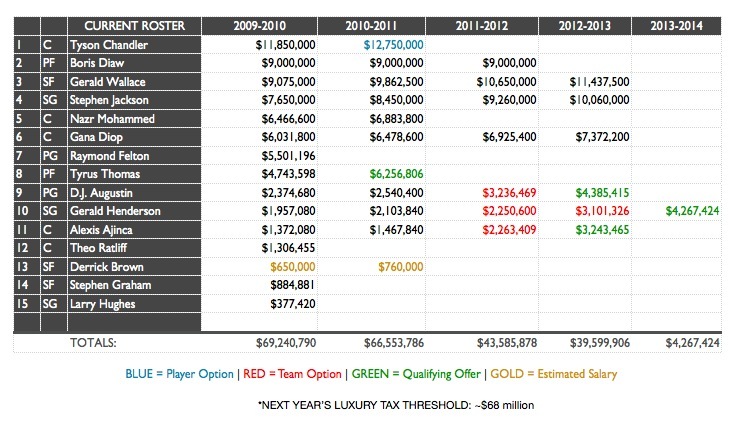 You read that right, the Salary Cap will shrink next year and with it the luxury tax threshold. 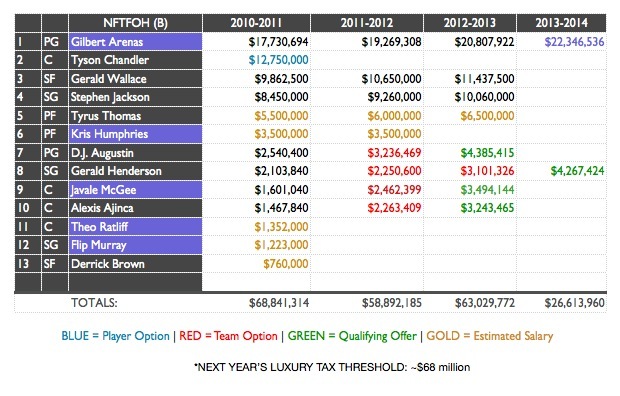 According to ESPN.com’s Chris Sheridan, the tax line will lower to around $68 million in ’10-’11 which would put the Bobcats at less than $8 million under the tax threshold before re-signing starting PG Raymond Felton (unrestricted), PF Tyrus Thomas (restricted) or valuable role players Stephen Graham and Theo Ratliff (click chart to see a larger image). The Bobcats have $27.5 million (roughly half of their cap space) committed to the center position and the last time I checked, none of those guys were named Howard, Duncan, Ming or Gasol. Years of poor financial decision making have finally caught up: overpaying Emeka Okafor when they didn’t have to (Chandler), overpaying Matt Carroll when they didn’t have to (Diop) and bailing out Joe Dumars with the expiring contracts of Walter Herrmann and Primoz Brezec (Mohammed). THE BAD NEWS: With the a possible lockout on the way in 2011, none of these guys are moveable unless the team is willing to take on another equally bad (if not worse) contract in return. THE GOOD NEWS: Over $19 million will come off of the books for good in the summer of 2011 if the ‘Cats just hold tight and let Mohammed and Chandler play through their contracts. Somebody take Larry Brown’s mobile phone privileges away pronto! 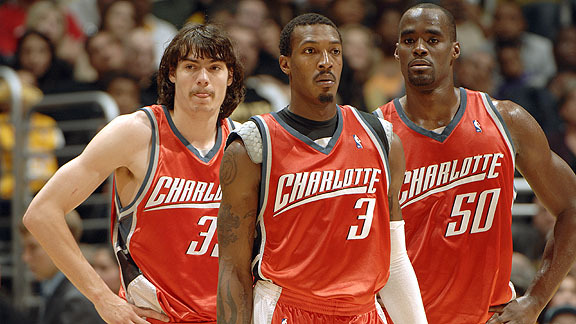 The Bobcats didn’t send Chicago a future first round pick just to rent Tyrus Thomas for three months. The intention was always to retain him for at least another season but given the Bobcats’ cap situation that might not be so simple. As a restricted free agent, Thomas could command a salary north of the $6.2 million qualifying offer he’s due based on his rookie deal. A team intrigued by Thomas’ potential and armed with enough cap space could offer Tyrus big money up front, signing Thomas to the dreaded “poison pill offer sheet” (see Milsap, Paul) during the summer. Such a contract could offer Thomas $8 million in year one, $6 million in year two and only $4 million in year three. The Bobcats would have the right to match but in doing so would essentially be “luxury-taxed-out,” unable to sign any other players (including a starting PG) without paying the dollar for dollar tax penalty — which is something Michael Jordan has repeatedly said that he will not do. With so many teams flush with cap space this summer, the Tyrus Situation could get tricky. Watch out for it. Ray Felton is the best point guard available in a weak PG free agency class. Again, it is entirely possible that a team flush with cap space could offer him $18 million or more over three years and in that situation the ‘Cats would have to fold. Doubt that the team would let it’s starting point guard walk this summer? The organization fiercely pursued a T.J. Ford trade during February’s trade deadline and weren’t even close to coming to terms on a long-term offer with Felton’s agent last summer. If Raymond was a better shooter from outside and could finish with a little more consistency inside (not to mention stay in front of Jameer Nelson) maybe the team would go out of it’s way to sign him but I just can’t foresee it happening. The ‘Cats will most likely have to acquire a starting PG via trade or from the free agency discount rack. 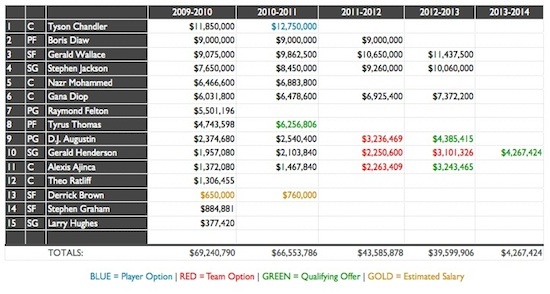 Yes, Bobcats fans, your team is in a major salary cap quagmire. To further complicate the issue, the Bobcats can’t afford to simply allow their free-agents to walk and replace them with low-cost scrubs or cheap rookies. The team doesn’t have any draft picks (instead they have Alexis Ajinca) and from a business perspective, the organization must improve their on-court product (or at least repeat last year’s success) in order to expand fan support and capitalize on their inaugural Playoff run. D.J. Augustin is clearly not ready to start and the Bobcats are too capped out to pay Raymond Felton market value. They’ll need to make a trade or find an undervalued bargain replacement in Free Agency (see Blake, Steve). Boris Diaw has a few low post moves but plays mostly on the perimeter and doesn’t concern himself very much with the art of rebounding. Tyrus Thomas (if he’s re-signed) is a solid rebounder but has limited abilities as a post scorer. The team will need to either trade for or sign a traditional low-post power forward to team with Thomas or Diaw. 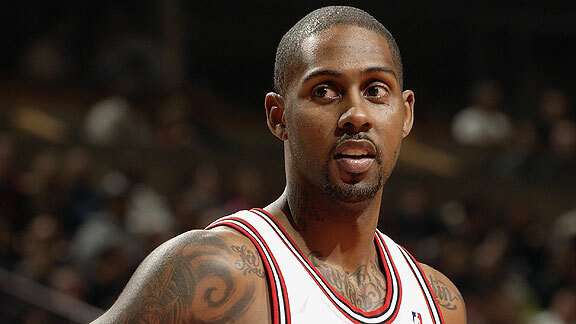 Larry Hughes turned out to be an inconsistent version of Flip Murray. Sure, Hughes was a better defender but what the Bobcats really needed was offense from the bench. Murray has said that he’d happily return to Charlotte next season. If the ‘Cats could bring him back for a similarly low priced deal next season, they should. So how does a Capped-Out team retain talent and, dare I say it, even improve heading into next season? Without Stephen Jackson for most of the second half, the Charlotte Bobcats still managed to lead the game until midway through the 4th quarter but a motivated Chicago Bulls team stormed back from a six point deficit to win the game 96-88 to move just three games back of the Bobcats in the Eastern Playoff race. Those of you who suffered along with me during the Bobcats Opening Night Massacre in Boston (92-59) will remember how painfully lost and dysfunctional this team looked pre-Captain Jack. A team of selfless role players was in desperate need of an alpha. Just a few games after he was acquired, Stephen Jackson assumed that role and the Bobcats never looked back, going 37-27 since November 22nd. While Gerald Wallace might be the clubhouse leader and an NBA All-Star, there’s no doubting who is more irreplaceable. During a three game absence in mid-March, the Bobcats beat the OKC Thunder and the Magic in Orlando as Wallace recuperated from an ankle injury. Tonight against the Bulls, in a tough-fought game with postseason ramifications, the ‘Cats were without their Alpha for the final quarter when they desperately needed some clutch buckets to counter the Bulls run. But they couldn’t do it. Captain Jack was sitting on the bench, seemingly wrapped head to toe, nursing a variety of injuries. Pressure was not made love to this evening. Pressure had a TV dinner, a half-pint of Häagen Dazs and fell asleep reading a cheap romance novel. Just three home games and three road dates remain for the Bobcats. None of them gimmes. Home against the Hawks (tough), at New Orleans and Houston (not easy) on a mini road trip and then home dates against the Pistons and Bulls sandwiched by a final meeting with the Nets in Jersey. Obviously, the Bulls season finale is important but if the ‘Cats win at least three of the next four, they should have their first Playoff birth locked up for good, regardless. Kirk Hinrich torched the ‘Cats tonight with 24 points on 9-12 shooting but this was an aberration — Hinrich is only averaging 10ppg on 39% shooting for the year. Still, if the Bulls could get Rose and Hinrich to play consistently together as they did tonight, they’d have a hell of a backcourt rotation. Charlotte’s heralded free throw opportunity advantage disappeared tonight. Chicago won the battle with 21-16 shots from the stripe. If Larry Hughes is supposed to be Flip Murray’s replacement, he did a good job keeping up with him tonight. Murray: 2-10 for 5 points, Hughes: 4-14 for 14 points. Hughes won the headband contest as well 1-0. 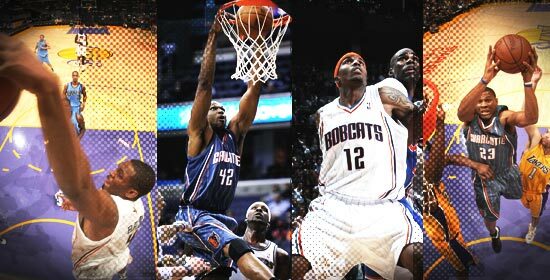 Which Bobcats Reserve Has Been Most Crucial? The Bobcats are closing in on their most successful season in team history, headed toward a spot in the NBA Playoffs and operating under new majority owner, Michael Jordan. The success is largely due to the leadership of Coach Larry Brown, and a roster upgraded with a collection of talent far above what Bobcats fans were used to seeing during the club’s first 5 seasons. The combination of Larry Brown’s prodding, Michael Jordan’s gambling, and Rod Higgins’ hard work has pulled this squad from unwatchable to a true Playoff team. Considering all of the new players on the roster this season, Stephen Jackson has clearly made the biggest impact as a newcomer. Dealing Vladimir Radmanovic and (injured) Raja Bell to Golden State for “Jack” was a gamble and a potential public relations risk but the on-court effect was a huge steal for the Bobcats. Too often, it seems that we hear Charlotte’s success has been due solely to Jackson’s arrival. It could be argued that the depth of talent on the Bobcats’ bench deserves just as much credit for the team’s consistent effort and defensive presence. Since last summer, Coach Brown, Air Jordan, and Rod Higgins have all been working on tuning the roster. The latest addition of Larry Hughes shows that the team is still tinkering, filling in the gaps in order to secure their first Playoff bid. Who Has Been The Most Important Reserve For The Bobcats? While the jury is still out on 2010 lottery pick Gerald Henderson and the recently signed Larry Hughes, we should take a look at the most important “role players” for the Bobcats so far this season. Offseason Free Agent Acquisition: Signed 1 year contract at $885,000. Undeniably, Graham’s greatest strength has been his professional approach and consistency while dealing with Coach Brown’s erratic rotation patterns. Lord Stephen Graham has played very well in spot duty throughout the season ranging from ten minute cameos in relief of Gerald Wallace to 35 minute starts during Crash’s week long absence in March. Graham played so well in that stretch (notching consecutive 19 point performances) that it’s not difficult to imagine the team bringing the veteran back next season to play a similar role. Stephen Graham’s physique stands out even among NBA players. When the season started, I first commented, “While other players spend the offseason working on jump shots and post moves, Stevie Graham worked on his delts.” The dude is a beast. Fortunately, this extra weight doesn’t seem to hamper his speed while defending opposing threes. Graham is a solid if not spectacular defender and shows a surprisingly nice touch on the offensive end when shooting from the outside. Not a great three point shooter, Graham knows his limits and won’t launch many. Good for at least a couple of highlight dunks every month, Graham can catch defenders off guard around the baseline for a post & spin move to the hoop. Graham was billed as a “George Lynch” clone early in the season and that’s exactly what he’s been, a solid NBA frontcourt reserve. Although Brown hasn’t been getting much burn during the second half of the season, his early work should (rightfully) raise fans’ expectations going into next season. The four year forward from Xavier was labeled a 2nd round sleeper on draft day and in spurts Brown has lived up to the billing – his potential was on full display during an 18 point performance against the Suns back in January. Derrick Brown’s size and athletic ability at his position will keep him in the League for at least a few more seasons. He’s an excellent open court finisher and a decent mid-range shooter. At 6’8″, Brown has excellent height for a SF which accounts for a high rebound rate at the position and has also allowed the team to play Brown at PF for stretches before acquiring Tyrus Thomas in February. With more seasoning, it’s possible that Brown could crack Larry Brown’s rotation for good next year but he’ll need to cut down on the mindless fouls and missed assignments that plagued him during the second half of his rookie campaign. Gone but not forgotten, Flip Murray proved to be exactly as billed: a scoring force off the pine, a strong personality with the cajones to take and make shots when others wouldn’t or couldn’t. Murray’s bench scoring (over 12ppg) provided a major boost during Charlotte’s dominating 12-4 run in January and his presence was immediately missed as the Bobcats went 2-5 following his trade to Chicago. Eventually, things returned to normal for both Charlotte and Murray as the Cats started winning again while Flip dropped 12.5 in 26 minutes per game with the Bulls in March. Flip Murray is gonna get his. Period. Flip will shoot (and make) half of his team’s shots while he’s in the game and for a team in desperate need of second unit scoring, Murray is a godsend. What he gives up at the other end of the court on defense he more than makes up for on offense. During a loss against Orlando back in November, Murray dropped 31 points in 36 minutes – that’s probably more Flip Murray than you really need though. He’s at his best in a 20-24 minute scoring role while the team’s starters have a rest. 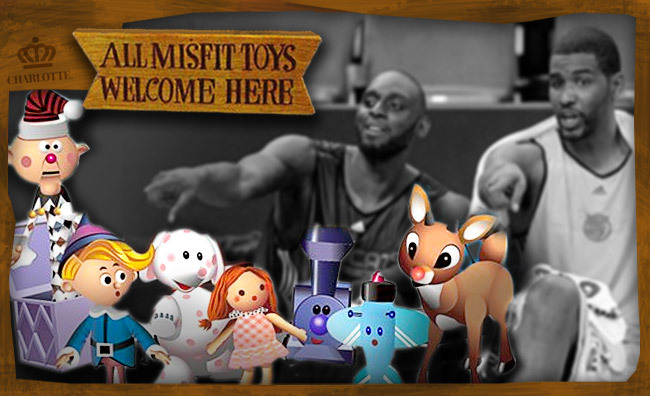 Bobcats fans were a little disappointed that the team didn’t pursue a veteran backup PF during the offseason. One by one, quality backups like Drew Gooden and Hakim Warrick were picked up by other clubs and the ‘Cats entered the ’09-’10 season without a legitimate PF to play behind starter Boris Diaw. While acquiring another big man was inevitable, no one believed that the team would be able to bring in a player like Tyrus Thomas, a 6’10” super-athlete with as much untapped potential as any young power forward in the League. Still only 23, Thomas stepped in and stepped up his game instantly and is averaging over 10 points, 6.5 boards and over a block in just over 20 minutes a game for the Bobcats since the trade from Chicago. His presence has allowed the Bobcats to offer different looks, as Coach Brown has played a small frontcourt Thomas, Wallace, and Diaw for stretches against smaller, run & gun squads. Although the price was steep (giving up a future 1st round pick along with Murray’s bench scoring), Thomas’ potential is worth the gamble. At 6’10”, it’s a little surprising that Tyrus Thomas has almost no post moves whatsoever. His offense comes mostly on thunderous putbacks, open court dunks or on unexpectedly sweet 15 footers. While his rebound and blocked shot rates are off the chart, Thomas isn’t exactly the world’s best defender. He’ll often be forced to foul or make a spectacular block from behind once his man has beaten him in the post. Still, Thomas has both age and situation on his side. Larry Brown mentored a similarly raw specimen in Gerald Wallace to an All-Star selection in just two seasons, it’s not hard to believe that Thomas could walk the same path if he’s willing to work on his game. BONUS: Having Thomas on the roster will give the Bobcats some flexibility heading into next season. As long as Tyrus’ contract demands aren’t outrageous, the team will definitely extend him or at least sign him to the qualifying offer for a year, making Thomas an expiring contract or a moveable asset should the team choose to go another direction. I don’t want to skew the voting here folks but c’mon, has there been anyone more valuable to the Bobcats late season success than Theo Ratliff? When Ratliff arrived mid-February from San Antonio (in exchange for very distant 2nd rounder) three of the four Bobcats centers were injured and the fourth was playing hurt (Nazr Mohammed). The 36 year old veteran showed up as an afterthought, a worst-case scenario insurance policy, and then proceeded to average 6 points, 4 boards and a block and a half in just over 20 minutes of action a night. The numbers don’t do Ratliff’s impact justice. Opposing players are aware of his presence on every possession that he’s out there and when the Bobcats trot out Ratliff, Thomas and Crash together on the frontline, there’s a one in three chance that a shot will be blocked. Simply amazing. The spry, second coming of Mutumbo has another unexpected trick up his sleeve: he shot 87% from the FT line in March (32-37), making him a little more valuable on offense. With Tyson Chandler finally healthy and playing well and Nazr Mohammed coming back soon, Coach Brown will have to reconfigure his rotation at center and that might mean reduced minutes for Theo. Doesn’t matter, Ratliff’s play in March propelled the Bobcats to an 11-6 record for the month, all but sealing the team’s first Playoff berth. Theo Ratliff is never going to win any battles down low with brute strength. He’s more of shot blocker, shot alterer and does this with ease. Technically, he’s a solid defender who can hold his own against the League’s top centers (see the March victory against the Magic in Orlando). On offense, Theo should be barred from ever touching the ball more than six feet outside of the basket. In fact, the semi-dashed circle underneath the basket that the officials use to determine blocking fouls versus charges should also be used by Theo Ratliff in determining whether or not he should take the shot. Look down, if he’s outside the circle, pass. In, dunk or get fouled and go to the line. Simple as that. Vote For The Role Player You Think Has Most Helped The Bobcats This Season. Adam Fleischer of SLAM Magazine broke the news last night on Twitter that Larry Hughes will be signing with the Bobcats in the coming days. This morning, Rick Bonnell is confirming the news, presumably from a team source. Hughes is a 12-year NBA journeyman who experienced the best stretch of his career in the early-to-mid 2000s when he was a major cog for the Washington Wizards. In 2002-03, a budding Hughes was signed by Michael Jordan to relieve His Airness and his balky knees. That season didn’t go so well, but after Jordan was fired in the offseason, Hughes came back to post the best marks of his career in 2003-04. He, Antawn Jamison and Gilbert Arenas combined to become the highest scoring trio in the league that year and led the Wizards to a 45-37 regular season record and a first round playoff victory over the Chicago Bulls. Hughes averaged 22 points, 6 rebounds and nearly 3 steals a game and was named to the All-Star Team and the All-Defensive 1st Team that year. That performance bought Hughes a huge free-agent contract in the 2005 offseason, as he was signed by the Cavs to a 5-year, $70 million dollar deal to be LeBron James’ first big sidekick. Unfortunately, injuries and an overall declining game contributed to things “just not working out” in Cleveland. This stint resulted in a Cavs fan creating the blog Hey Larry Hughes, Please Stop Taking So Many Bad Shots, which amazingly was still being updated with Larry Hughes news as recently as last month. Hughes’ minutes and scoring average have generally fallen every year since then, as he has bounced around between the Knicks and Bulls. Hughes has had two career lowlights in the past few seasons. The first came almost exactly two years ago, when Hughes, then a Bull, made comments to Cavs beatwriter Mark Windhorst that his goal as an NBA player was not necessarily to win, or win a championship. 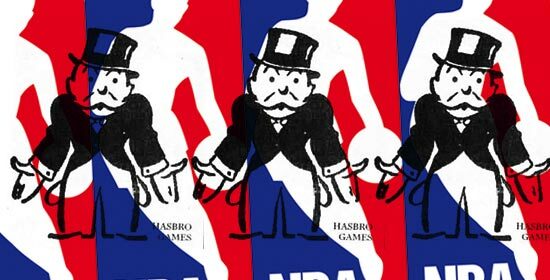 Instead, Hughes indicated that he could be just as happy collecting his check and playing the way he preferred, which presumably was to be running the wing and jacking up a lot of shots — even if that didn’t translate to winning. The comments essentially amounted to sacrelige and Hughes’ reputation has suffered greatly since then. It hasn’t helped that his production has continued to decline, either. Hughes second lowlight came earlier this season when he suffered the ignominy of riding the bench for the New York Knicks. Now we may have to look back upon this from a slightly different angle as Mike D’Antoni’s wunderkind “7 seconds or less” reputation as a coach is increasingly taking a beating as time goes on, but the fact remains that Hughes was essentially deemed useless by a 22-44 team this year. Hughes is a 6’4 or 5″ combo guard who will essentially fill Flip Murray’s role. This shouldn’t come as much of a surprise, as Larry Brown is currently without his beloved “veteran third point guard” and couldn’t have been expected to go on much longer without such a trope/security blanket. Beyond the fact that Michael Jordan brought Larry Hughes to the Washington Wizards back in 2002, Hughes has even deeper connections to the Bobcats — Larry Brown drafted and coached him to start his career in Philadelphia, and per Wikipedia, Hughes is a childhood friend of rapper and Bobcats minority owner (still?) Nelly. Whether Hughes has anything left in the tank, or whether he’s willing to sublimate his ego enough to play spot minutes as a combo guard (sorta the role he bristled at in Cleveland) remains to be seen. Perhaps most concerning for Bobcats fans is that the departure of Flip Murray has been associated with the rejuvenation of DJ Augustin and the emergence of rookie Gerald Henderson (maybe “emergence” is a bit strong, I know). If Hughes’ presence results in any regression for these two young players, Bobcats fans will certainly be up in arms. More likely than not, though, Hughes simply represents a cheap “insurance” option for the Cats, should Felton or Augustin suffer an injury down the stretch, or Henderson prove to be completely unprepared for even short stints of playing time in a pressure-filled playoff game. Here’s hoping we don’t have to rely too much on him, though. On a wild NBA Trade Deadline Day, the Charlotte Bobcats swung a deal to get the elusive athletic power forward that Larry Brown has been pining for all season. The Cats have obtained Tyrus Thomas from the Chicago Bulls in exchange for Ronald “Flip” Murray, Acie Law, and a future first round pick. I touched on Thomas in an earlier post; the knock on him is immaturity/lack of consistency. More specifically, Thomas is infamous for “mental lapses.” This makes him an interesting match with Larry Brown, who demands near-perfection and is a stickler for detail. Most players in a Larry Brown system take awhile to “get it,” going through a process of assimilating everything before eventually settling back down and really showing improvement. However, not all players respond, so this will either be the best thing that happened to Tyrus Thomas or a spectacular disappointment. If Thomas does work out, it will be interesting to see what happens with Boris Diaw. As we’ve watched Boris since he’s been a Bobcat, it’s clear that he’s struggled this season while playing with Steven Jackson. Last year, prior to Jackson’s arrival, more of the offense ran through Diaw as he was able to utilize his “point-forward” skills. Could Thomas eventually start, allowing Boris to move to the bench as a sixth man? It’s not a perfect solution to the Jackson/Diaw conundrum, as Jack plays so many minutes that it’s inevitable that Diaw will play with him some. But this way you could maximize the time that Diaw is on the court with the offense running through him, and not Jack. Furthermore, we’ll be watching to see what happens with Thomas in the offseason (and Diaw, for that matter). The Cats will be in pretty much the same boat with Thomas as they were with Raymond Felton this past offseason. Thomas will be an unrestricted free agent, which means any other team will be able to offer him a contract starting at a qualifying offer of $6.2 million. The Cats would then have a right to match. But even with all the cap space out there, would any team in their right mind offer Thomas a contract for that much? Might the Bobcats be able to sign him to a more reasonable deal instead? Here’s looking forward to seeing Thomas in action for the first time soon; we don’t have any confirmation yet, but one would assume that the Cats will be trying to get Thomas suited up for Friday night’s tilt with the the Cavs. Acie Law was thrown in to the Stephen Jackson trade to make salaries match and because Larry Brown is perpetually auditioning “third point guards.” However, Law had already been a bust in Atlanta, wasn’t getting any playing time in Golden State, and couldn’t break into the Bobcats rotation either. The few moments that Law did get off the bench were primarily garbage time; even then he looked hopelessly overmatched. His shot wasn’t falling, he didn’t seem quick enough, and didn’t show any real confidence or “game-managing” ability. The one significant chance that Law got was in a December matchup against the Knicks in NYC. Down 2 with seconds left, Law was inexplicably inserted into the game. Furthermore, the play was drawn up for Law to get the ball on the final play — he took it coast-to-coast and forced up a layup that never really had a chance and was easily swatted away by Danilo Galinari to seal the Knicks win. I would be willing to bet that Law will be out of the league and playing overseas next year. He’s just not skilled or athletic enough to make it in the Association. For Chicago, he simply represents a $2 million expiring contract as they clear room to make a splash in the Lebron/D-Wade/Bosh/Joe Johnson free agency sweepstakes this summer. Flip is the definition of a journeyman in the NBA. The Bulls will mark Flip’s 8th NBA team in 8 years. It isn’t exactly clear why this hired gun can’t stick anywhere or get a long-term contract. Offensively, he’s an above-average, sweet-shooting, somewhat undersized 2-guard. Though ballhandling and distributing are not his strengths, he can slide down to the point in a pinch. This is how he’s been able to carve out a career in the league. Defensively, he’s below average, due to his size and lack of elite quickness and athleticism. This fact probably comes the closest to answering why Flip has, and will continue to have, a journeyman’s career. Flip was signed to a bargain 1-year $1.9 million deal by the Bobcats prior to the season and was a good fit. After sitting out several games to start the season, Flip joined the lineup and frequently provided a much-needed scoring punch off the bench. He is currently averaging 9.9 points per game — exactly his career average, too — but is not shooting as high of a percentage as he had in the past. Nonetheless, he will be missed. While the Bobcats blogosphere is undoubtedly hopeful that DJ will step up and Gerald Henderson might even see some playing time, the safe bet is probably on Steven Graham filling in for the bulk of Flip’s minutes. Ultimately, he was included in the trade from the Bulls’ perspective because he is on a one-year/expiring deal, but Flip will probably play an important role for the Bulls the rest of the season. Remember, Chicago traded away John Salmons for more cap relief, so they have a hole at the 2-guard spot. This one is probably the hardest to part with. As we’ve said over and over here at the Baseline, the best way for a small-market team to jump-start a run at a championship is to hit a home run with a first round pick (the Spurs and Tim Duncan are probably the best example, here). But under Larry Brown, the Bobcats are clearly going about business another way. And with Michael Jordan’s disastrous track record at making draft selections, maybe it’s a good pre-emptive strike to trade away picks for young veterans anyways. Let’s remember a few things, though. First, the Bobcats already owe a first-round pick to the Minnesota Timberwolves; second, you cannot trade away your first round pick in consecutive years and third, it’s not yet clear if there are any further conditions on the pick used in today’s trade. The initial pick we have to give up was traded to the Denver Nuggets in the summer of 2008 (for their #20 pick in that draft, which we used on Alexis Ajinca — that’s a whole other story); the Nuggets have since moved it in another deal and it now is the property of the T-Wolves. The pick is protected somewhat; last year it was protected if it was in the lottery, so we got to use it on Gerald Henderson. This year it is only protected if it’s even higher, like a top 8 or 10 pick (Note: not exactly sure on that). Whatever the case, barring a total collapse by the Cats, it looks like our first round pick this year will be the property of the T-Wolves. So, given the rule about not trading away your first round picks in consecutive years, the earliest that the Bulls will get our pick in exchange for Ty Thomas will be 2012. That’s a little scary, as Larry Brown will probably be gone by then, and who knows what the roster will look like. It’s entirely conceivable that the Cats could return to the lottery by then and desperately need some help in the draft. UPDATE: No sooner than I posted this and sat down for some dinner does Rick Bonnell come through to confirm that the future first-round pick owed to the Bulls for is indeed protected. The exact nature of the protection is still unclear, but it is assumed to be similar to the protection that is attached to the pick that we currently owe to the T-Wolves (the exact nature of which is also unclear, but whatever…).